Following their Game 1 triumph over the St. Louis Cardinals, the Boston Red Sox have increased their leading World Series probability to a dominant 72%. The Cardinals' WS% plummeted all the way down to 28%—their lowest since defeating the Pirates in the NLDS. You'll note that the AL home field advantage has now disappeared. This makes sense, considering that there are now six games remaining: three in Boston and three in St. Louis. After tomorrow's game, the Cardinals will actually have a small home field advantage in their favor. See below for the World Series breakdown and a ratings system update. The system is still projecting a Red Sox win in six games, and the Cardinals' best hope is still to push the Series to seven games. 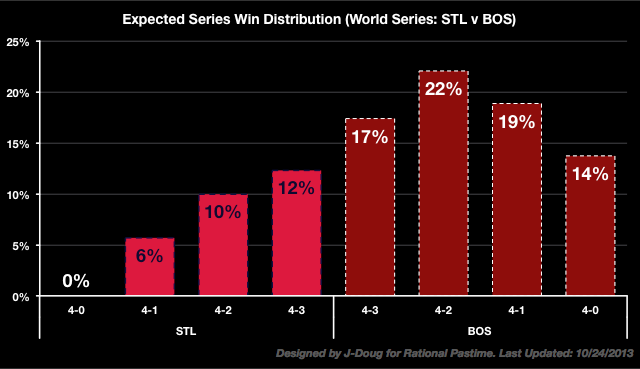 At this stage, all four possible Boston wins are more likely than all three possible St. Louis wins. One of the reasons for Boston's dominant position is a jump in their rating. An 8-1 win yielded a substantial increase in their Elo-AVG and an even larger jump in their Pythagenpat expected win percentage. 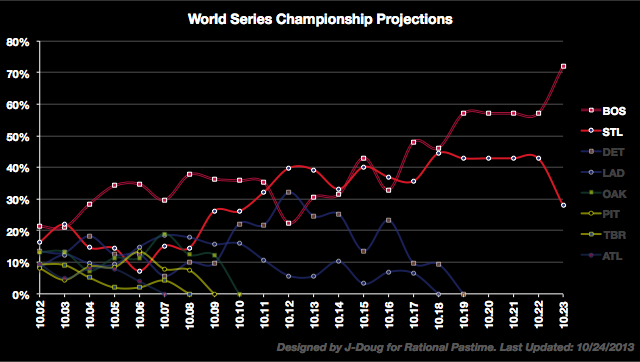 Their increase of .006 added 2% to Boston's World Series title chances. Check in tomorrow to see if St. Louis can even it up before they take the Series back home.